Bazaar Chorsu, «Eski Juva», Ancient bazaars of Central Asia, Oriental bazaars, Sights of Tashkent. Bazaar Chorsu (officialy called «Eski Juva», which means "Old Tower”) is one of the largest and oldest bazaars in Central Asia, it is under seven huge domes, covered with colored glazed ceramic tiles, there are the pavilions in bazaar, which abound with many fruits and vegetables. Regardless of the time of year your eyes run from the abundance and variety of goods. Even in ancient times people came here from all over the city (merchants, traders and ordinary citizens), not only to buy or sell something, but to know any news, there were also theatrical performances with singers – hafiz, clowns, tightrope walkers, sages and also there were cockfights. Here you can taste real Uzbek palov, shashlik and other national dishes. There are many beautiful apples and honey pears, grapes, fragrant peaches, garnets, unusually huge watermelons and melons like mountain peaks. Spicy scent is lured you that you cannot pass by. There are black and red pepper, nutmeg and cardamon, cumin and zira. 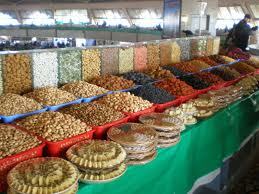 Orient bazaar Chorsu is full of dried fruits and nuts: dried apricot and raisins, peanut and walnuts, pistachios and almonds are attracted the customers. Craft rows are located in another pavilion, there are handmade souvenirs, jewelry, embroidered suzani, national knives – pichok, baskets and chased trays, national musical instruments. 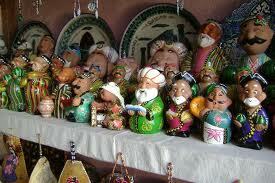 All this tourists buy as souvenirs of Uzbekistan. There are carpets of different sizes and shapes in another pavilion, also carpets from Samarkand, Bukhara and Khiva. 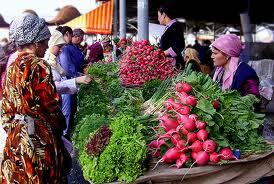 Tashkent bazaar Chorsu is the place where you can plunge into the world of oriental tale and feel its atmosphere. It always hospitably opens its doors for residents and guest of country.